For example, we recently saw the Delhi Traffic Police (DTP) using Facebook  to collect information about traffic violations. 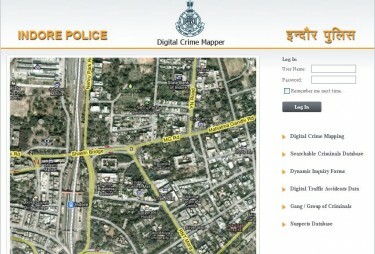 The Indore Police Department  has been using a blog, Twitter, online and mobile complaint forms, a Google map of police stations  and a digital crime mapper  to track criminal activities in the region. The Maharashtra Police Department  launched an SMS-based complaint tracking system  (CTS), called “Turant Chovis” (“Within 24 Hours”), which promised to quickly redress citizen complaints by sending a first response within 24 hours and resolving the issue within 30 days. One of department's divisions, the Nasik Rural Police Department, even won appreciation at the Manthan Awards 2009  for their presentation  on the modalities of the system and how they had achieved 96 percent success in implementing the Turant Chovis scheme. Adoption of technology for better governance is not restricted to the police departments alone. Various state governments are also beefing up their e-Governance initiatives with use of interactive technology in areas such as citizen grievance redressal. 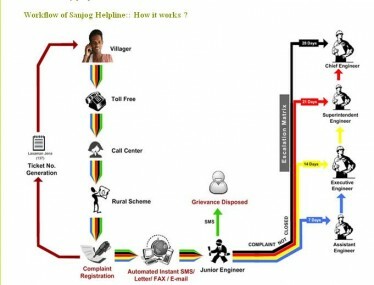 The Sanjog Helpline  is a single-window centralized grievance redressal system  for the rural state of Orissa. Citizens can register grievances through a toll free number, fax or e-mail, as well as through the Sanjog Helpline portal in their villages. They can also at a later stage track and get acknowledgment of the status of their complaints. Jhansi, in Uttar Pradesh, has launched the Jhansi Jan Suvidha Kendra , a telephone-based grievance redressal system. The Madhya Pradesh government has an online complaint registration facility  on its website. The site also allows tracking of individual complaints and displays statistics regarding the number of complaints received and successfully resolved. Recently, an experience with the online railway booking system has left me more skeptical of these initiatives. It's true that the online railway booking system  has made life easier. No need to queue at the counters, no need to pay an agent or middle-man to get confirmed bookings. However, try to get some refunds for a canceled ticket, and then you will face the music. This January, when a train I was supposed to take was delayed for over 10 hours, I decided to cancel the ticket instead of wasting time at the station (the rules online clearly stated that full refund will be given if a train is more than 3 hours late). However, I could not cancel my ticket at the station, as a ticket booked online can only be canceled through an online application.